Crooks and Liars has the video, you have to see it. Bill O'Reilly almost busted a gut. GERALDO: "Cool your jets! It has nothing to do with illegal aliens…it has to do with drunk driving! Don't obscure a tragedy to make a cheap political point. It is a cheap political point and you know it!!" "A young girl was tragically killed by a drunk driver. But this was not enough for O'Reilly. Instead, because the criminal was an illegal alien he added this incident to his ongoing crusade against the brown people. 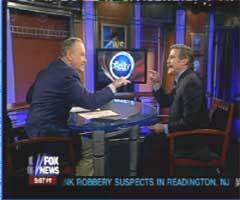 Luckily Geraldo was on the show and he - to his credit - called out O'Reilly's xenophobia for exactly what it was. This drove Bill O'Reilly insane. I was almost certain he was going to reach across the table and hit Geraldo." The issue is drunk driving, not immigration -- as correctly noted by the victim's family and the town Mayor.